When I heard the news of former Vietnamese Premier and Air Marshal Nguyen Cao Ky's death this week, I was immediately whisked back to Saigon about a month before it fell to the Communist North Vietnamese in April 1975. It was March 27 and I had gone to visit Ky at his sprawling home on Saigon's Tan Son Nhut air base. He greeted me wearing the black pilot's flight suit and purple scarf he liked to be seen in. I had never met Ky before, but I had heard a lot about him. Stories said he was a swash-buckling "Top Gun" kind of guy who never backed down from a fight and had a reputation as a womanizer. He may have been all of those things, but the day I met him he was pensive and worried about the future of his country--as well he should have been. North Vietnamese troops were less than 50 miles from Saigon and everyday they were pushing South Vietnamese forces further south. For those unfamiliar with America's war in Vietnam, Ky was a staunch American ally during that conflict. 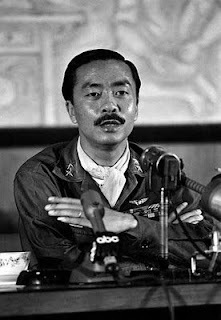 But even more than that, he was a combat pilot who eventually became the head of Vietnam's Air Force and in 1965 became Vietnam's Premier--a post he held until 1967. From 1967 to 1971 Ky served as Vietnam's Vice President under Nguyen Van Thieu--South Vietnam's last president. When we met in 1975 Ky had been out of Vietnam's political scene for almost four years--preferring to sit on the sidelines. Nevertheless, he still had tremendous support from Vietnam's Air Force and probably could have led a successful coup against President Thieu, who was under heavy fire for a strategy that called for abandoning the Central Highlands of Vietnam and allowing the North Vietnamese to take control of a large part of South Vietnam. "That was without doubt a major military error," Ky told me. "And President Thieu must live with that decision the rest of his life. In fact, it may turn out to be South Vietnam's death knell. I do believe Thieu should resign, but I am not in favor of a military coup. Vietnam must remain united in the face of the onslaught from the North." We walked around Ky's compound and as we did he pointed to a helicopter sitting nearby. "See that?" he asked, pointing to a HUEY helicopter. "That is my last resort. If the Communists reach Saigon I will take my family out in that chopper." That is exactly what he did--landing on the deck of the USS Blue Ridge on April 29, 1975. During his time at the top of Vietnam's political pyramid he, along with other Vietnamese officials, were often suspected of profiting mightily from the $686 billion (in inflation adjusted dollars) Washington poured into the South Vietnam between the early 1960s and 1973 when the Vietnamese peace agreement was signed in Paris. "If I had stolen millions of dollars would I be here operating a liquor store?" he asked. "Wouldn't I be living like some sultan or king? Wouldn't this modest house be a palace?" Ky paused to light a cigarette, and then continued. "Look, I am not a born politician. I am an artist, a flyer, a romantic. Back in 1967 I was very strong in Vietnam and I could have been president, but I stepped aside in favor of Mr. Thieu. I am just not a political animal." Nevertheless, about a month before South Vietnam's fall, Ky was coaxed out of retirement to be part of a new "Government in Hiding." That unofficial entity had at first attempted an unsuccessful bloodless coup against President Thieu then when several were arrested, it went underground in an attempt to gain power before the North Vietnamese entered Saigon. Ky was not arrested because Thieu feared (probably correctly) that the VNAF would come to his aid. As we sat in KY's compound on the outskirts of Saigon that March afternoon in 1975 we could hear the sounds of North Vietnamese artillery and mortars pounding South Vietnamese positions less than 10 miles away. "It is only a matter of time," Ky told me. "Realistically, the NVA could come into Saigon anytime. But I think they are waiting to see if Thieu will step down. And I also believe they still are not quite sure what the Americans will do if they do roll into Saigon. After all, they are in violation of the 1973 Peace Treaty--though I have yet to meet a Communist who honors any kind of treaty." "I am not bitter about America's involvement here, but I am bitter about the fact that her policy makers never listened to my advice," he said. "That is a glaring weakness with American foreign policy. Washington politicians and bureaucrats think they know more than the natives of a country like Vietnam when in fact, they really don't. That is the arrogance of Washington and in my opinion it is an attitude that will always get America into trouble in countries they know very little about." "I have consistently told Washington you cannot win a defensive war in Vietnam when the other side is engaged in an offensive war," Ky told me. "By fighting a limited, defensive war, the U.S. allowed the North Vietnamese to continuously re-supply their units in the field. Why did they do this? Because weak politicians in Washington were terrified that the Communist Chinese might intervene if the U. S. got serious about defeating the North Vietnamese. They didn't want a repeat of the Korean conflict. "The worst thing that happened to South Vietnam was when we allowed the United States to take control of our war with the North," Ky said. " Long before America decided to quit the war, I realized that this would be the inevitable result of America’s lack of commitment to victory. I offered to lead a South Vietnamese attack on North Vietnam, which was defended by a single division of regular troops. All I required from the US was air support, and that US troops already in Vietnam would defend population centers. My purpose was not to conquer, but to force Hanoi to withdraw its divisions from the South in order to defend the North, and thus to bring about genuine peace negotiations." "Would you like a 33?" he asked, referring to the popular Vietnamese beer. He retreated to the kitchen of his compound and returned to with two half-liter brown bottles of "33 Biere." "You know, any military strategist with any training knows that the best defense is a good offense," Ky continued. "But even our defense was passive. So-called 'Search and Destroy' operations were kept within South Vietnam's borders. Enemy territory was always a safe rear base. The North Vietnamese also used neighboring Laos and Cambodia to establish lines of communication, supply bases, recuperation centers for their troops. The enemy general staff had adopted a plan of action calling on them to always take the initiative. When their troops are strong, they would attack, but when they were tired and weak they would withdraw to their rear bases to rest, recuperate and regroup." Ky lit another cigarette. "Someday I will put all of this into a book," he said. Ky did just that, publishing "How We Lost the Vietnam War" in 2002 some 27 years after we shared those "33 Bieres" in his Saigon compound. The gist of that book was less of a condemnation of the American military, which acquitted itself well on Vietnam's battlefields, than a disparagement of Washington's insistence on applying Occidental solutions to Oriental problems. In essence the book argues that America cannot project its values, beliefs and customs on an alien culture and expect success. In 1980, sitting in Ky's house in Westminster, California, our conversation seemed to pick up where it left off in 1975. "To insist that Vietnam fight a war while at the same time building democracy was impractical," Ky said. "Building democracy in the West, in England and then in the United States, took centuries of struggle. We Vietnamese could only begin to build democracy after achieving peace and independence. And even then, democracy could not be achieved overnight, but must be built in stages and in harmony with the cultural, social and economic traditions of each people. To accuse South Vietnam of not establishing a democratic regime and to use that as an excuse for abandoning South Vietnam was a blatant betrayal of a trusting ally that had put all his faith in the word of America." Ky added that the White House and the Pentagon directly conducted the war from thousands of miles away, issuing contradicting policies with ever- changing directives that created confusion in commanders at the front." "The B-52 carpet bombings ordered by President Nixon toward the end came too late and were too short-lived," he said. "They served only to pressure the Communists to come to the Paris peace talks so that America could prepare for an honorable withdrawal from Vietnam. "After Watergate, America was a ship without a rudder," he continued. "Vietnam was left to its own devices, drifting along towards its fate. The disintegration of April 1975 was an unavoidable conclusion. My only regret and sorrow was that that ending was shameful and tragic." Rest in Peace Nguyen Cao Ky. If your wish was to be buried in Vietnam, I hope the US State Department can facilitate that! Most people today do not know who you are. You knew who you was. I wish you could have been around longer. You had an extraordinary abilty to know history, cultures, and how to solve problems. Amen. man with his words at that time. his former country to be divided. the right things for Vietnam outcome. Rest in peach, VP Ky! Air Marshall ky was a great man, intelligent, brave and charismatic. I know this is a little late but rest in peace Mr Ky.
Not that it matters, but I believe Air Marshall Ky landed on the USS Midway, not the Blue Ridge as stated in your blog. I am preparing a photo collage for my dad's (RAdm. Willam L. Harris) 90th birthday, including a photo of him greeting Ky on the Midway deck. ~1100H, 29Apr75.